Lots of people give George Lucas all kinds of credit for being the first to see the licensing potential of a film, and milk it all the way to the bank. Au contraire, my friends, he was simply seeing what had happened with The Planet of the Apes, and was smart enough to know he could do the same thing with his films. Planet of the Apes was the first movie to suckle at the teat of mass market merchandise, and they did it with gusto. Lunch boxes, pillow cases, clothes, toys, food tie ins...they had it all. They also had five movies, a short lived cartoon, and an even shorter lived television show. And no, I did not accidentally leave off the Burton remake. Best we not discuss it. As I recall, Dr. Zaius was only in two of the films, but he represented all that can go wrong with government. In his attempt to hide the truth from the masses, and in believing that the ends justifies the means, he reminded us how easy it is for people in power to become deluded as to right and wrong. Sideshow is producing a very cool and very broad line of sixth scale action figures based on the old films. 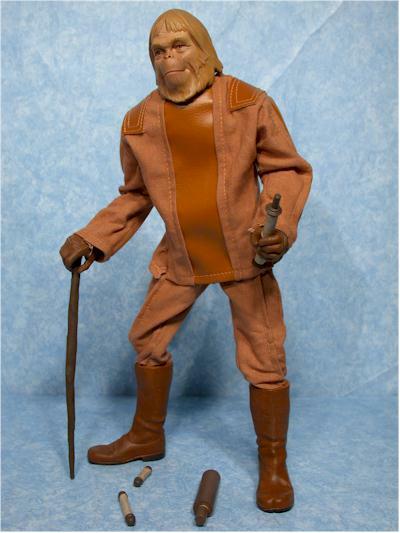 The first figure to see release is Dr. Zaius, in his regular and exclusive versions. They already have Cornelius, Taylor (who is already sold out at their site), Forbidden Zone Taylor (also sold out), Zira, Ape Enforcer, Ape Maurader (a Sideshow site exclusive), and a two pack of Taylor in his slave gear with Nova. 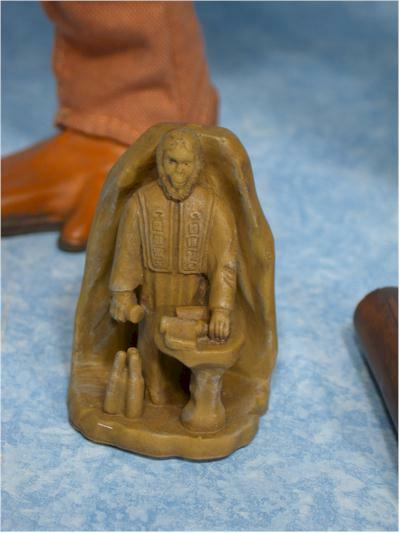 And if that's not enough for you, they are also releasing a polystone version of The Lawgiver statue. At nearly 19" tall, it's actually in fairly decent scale with the 12" figures. No, not perfect, but big enough to certainly impress the ladies! A lot of the other figures will be shipping very soon, so if you've pre-ordered, expect to get hit with oodles of monkey love in the next few weeks. 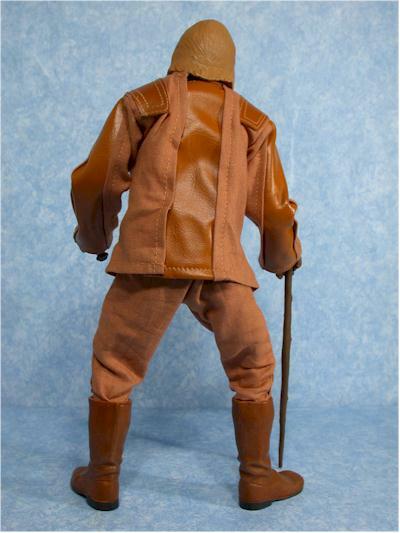 I'm reviewing both the exclusive and regular versions of Dr. Zaius, because this time the exclusive version actually has a whole new outfit, and hence, a very different look from the regular release version. 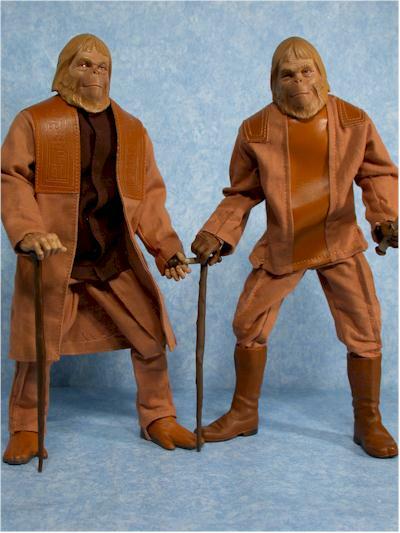 The box for the regular and exclusive versions is identical, both showing shots of the 'normal' Dr. Zaius. The text is decent, with a reasonable amount of information and some great photos. At first I thought I'd died and gone to heaven, because for the first time ever, there wasn't even a twisty tie going all the way through from the plastic tray through the cardboard tray! Then I saw the plastic string ties - not twisties - around the neck and several accessories. While I'm glad there are fewer twisties, the strings are even more difficult for the MIBer to reuse, and unlike twisties, you usually have to have a knife handy to cut them. I wavered a lot on this sculpting score, almost dropping it another half star. It's not because it isn't accurate - it is. It looks very much like the movie Dr. Zaius, although it's a little thin in the face. No, it's not the accuracy, but the detail that's lacking. This head sculpt is very soft, lacking much detail in either the hair or the face. The standard monkey wrinkles (or in Zaius' case, ape wrinkles) aren't as pronounced or deep as I expected, and the hair does not have the level of detail we've come to assume. To convince yourself, simply compare the photo of the prototype on the front of the box to the actual figure. Notice in particular the eyebrows and facial hair - see the lack of crisp detail? The prototypes started out perfect, but somewhere along the line in the tooling process, much of that detail was lost. The hand sculpts are different for the two figures, one bare and hairy, the other wearing funky gloves. But both figures can hold the accessories perfectly, especially the handle of the cane. I'm hoping that this softer style isn't what we get with Zira and Cornelius, who I'm really looking forward to. The majority of the paint ops are on the head and hands, as usual with this style of sixth scale figure. The color is about right for the face and hair, at least in terms of movie accuracy, and the eyes and smaller details are clean and neat. The tone of the hands and face match well, and there colors are consistent across the figure in general. My only major complaint is that perhaps a slightly heavier or darker wash on the face may have improved the look of the soft sculpt, bringing out some of the details a little better. Sideshow makes one of my favorite sixth scale bodies, but it's not always without its problems. One of the things I like so much is the cool wrist and ankle joints, which allow for movement in just about every direction, and the ball jointed necks. There are times though when the joints are loose, or the only really good pose the figure can take is standing up straight, looking like a shy teenager who isn't quite sure what to do with his hands. That is not a problem at all on either count with the Dr. Zaius figures. 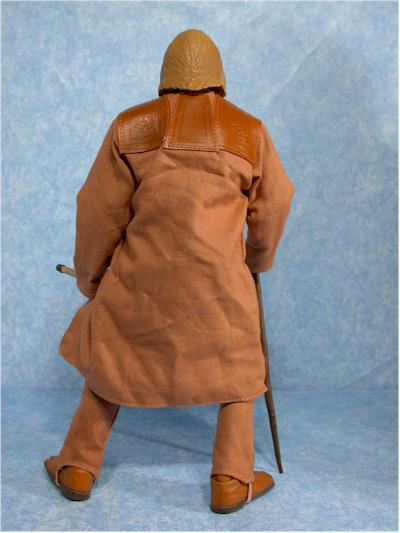 I was able to get a great looking hunched pose, and use the cane perfectly, with both figures. That's very important for the display, since while the monkeys might have been smarter, the humans still had better posture. The joints are nice and tight as well, so that while I have him posed holding his cane as though he needs it, he's not actually resting on it at all. The figures stand great on their own with no need for any support. 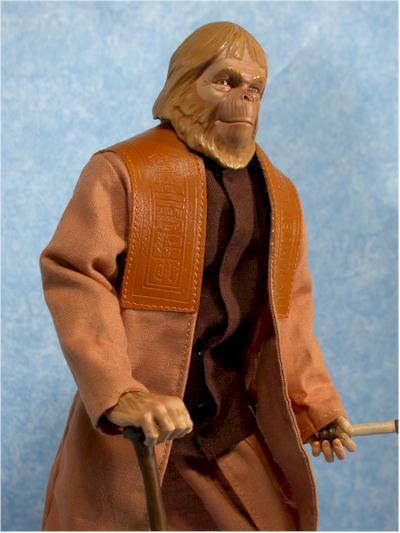 The regular Zaius is wearing the outfit we see him in most, with pants, black shirt, overcoat, and nifty orangutan sandals. The sandals actually pop on over the normal human feet of the standard Sideshow body, but they fit well and look great. The black shirt is a full shirt, with complete sleeves. No cheaping out this time by skipping the sleeves, and the overcoat has the plastic engraved 'lapels', right from the film. The stitching and quality of the outfit is quite high, and while it isn't an overly complicated outfit, it's done quite well. I believe the exclusive outfit was what Zaius wore out into the Forbidden Zone when they visited the archeological dig site. It has boots, the same pants as the regular version, and a new shirt. While the shirt/jacket combo of the regular version was two piece, this shirt is all one piece, with pleather sown 0nto the front, back, and arms. This shirt seems cheaper quality to me, particularly in the stitching. It fits fairly well - the tailoring is quite good for both figures, actually - but the exclusive version certainly looks like the poorer cousin on the shelf next to the regular version. The boots are the best part of the exclusive costume, with a great sculpt and nice fit. Still, with a five dollar higher price tag, you're getting a lot less costume. 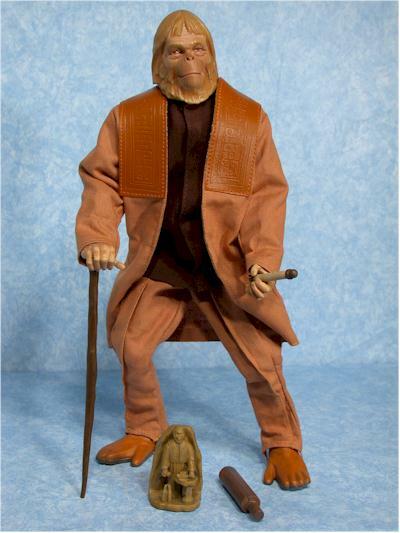 The regular release figure comes with his cane, two scrolls, and a miniature version of the Lawgiver statue. Also, all the POTA figures will come with a display stand, with the license emblem on the base. The exclusive version includes the same cane, the same two scrolls, and two smaller scrolls of different sizes. While the scrolls had import in the movie, they simply don't make for very cool accessories. Neither does the Lawgiver statue, for that matter. 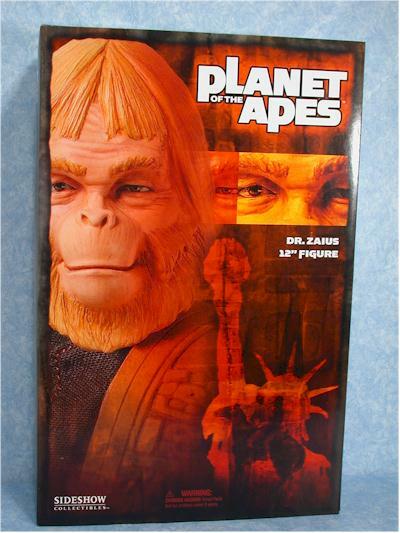 I suspect they have a rough time coming up with something for Zaius, but I would have preferred the human doll (which will come with the two pack Nova) to be included here. These are nice, solid, well constructed figures, that are sturdy enough for play as well as display. There's no small parts to break off, and the costumes don't have weak parts like belts or bags that could easily tear. I doubt there are too many kids who have any idea who these characters are, but they are perfect for anyone with a primate passion, looking for a fix. Sideshow figures, especially licensed figures, aren't cheap by any standard. If you want to own the complete set, and pose them all around the Lawgiver statue, you'll be $525 poorer so far. But the $40 price tag that Sideshow charged for the regular version seems to be getting pretty standard for the sixth scale licensed figure market. However, the exclusive version costs another five bucks, and unlike the regular version that you can pick up for $35 or under from other retailers, it's a Sideshow exclusive. With weak accessories and a less appealing outfit, the exclusive is a worse value. This is the first time EVER that I've prefered the regular version of a Sideshow figure to the exclusive version. Normally, the exclusive ends up with an extra accessory or two, and they tend to be seriously wicked accessories, so who wouldn't prefer that? But this time, the accessories are actually weaker, and the exclusive outfit simply isn't as nice. I hope we don't see too many exclusives in all new outfits. While it will force some of us suckers, uh, consumers to actually buy both versions, it may also alienate the smarter ones. There's nothing negative on these to watch for, nothing easy to break or easy to screw up. However, make sure you play around with the cane handle when you're putting it in his hand, because it does pop in nice and tight in one way. The hand and cane are sculpted to work together, but you have to fool with it a bit to get it just right. - Alter Ego Comics doesn't have Zaius listed, but they do still have Taylor (the regular version) available at $32, along with several of the others. - Southern Island has the regular Zaius at $35, along with Taylor and several others. 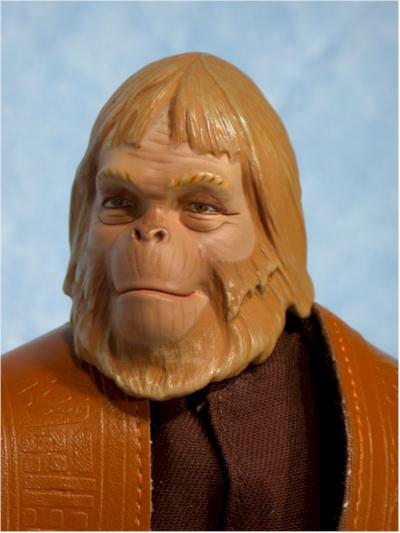 - Killer Toys has the regular Zaius at $35, along with many of the other figures.